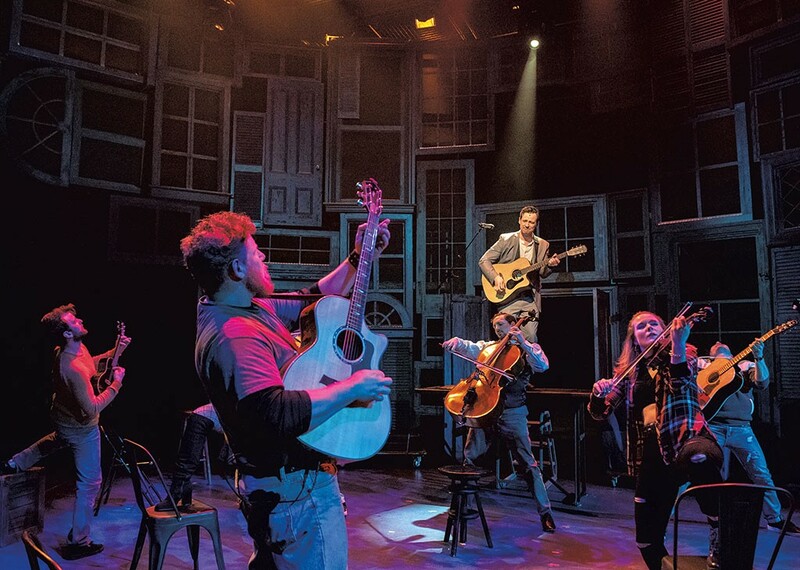 With songs that start as mere glowing embers and then steadily rise in strength to brilliant blazes, the musical Once gives the triumph of hope an unmistakable sound. In the production at Northern Stage, powerful vocals and vigorous instrumentation showcase the glory of live performance. Once, which won the 2012 Tony Award for best musical, is based on a 2007 movie that starred the composers of the songs, Glen Hansard and Markéta Irglová. Set in Dublin, the story brings together a busker ready to give up on music and a Czech immigrant who spins him in the opposite direction, helping him find new purpose. Enda Walsh, who wrote the book, keeps it simple and archetypal, naming his protagonists Guy and Girl. When Girl first hears Guy singing of heartache on an empty street, she doesn't just compliment him, she rescues the guitar he's abandoning and puts it back in his hands. It's not a flirtation. If Guy is carrying around a song like that, Girl concludes, he's still nursing a broken heart. Instead of letting him wallow in despair, she invites him to a music store where she can play the piano with him. Every musical must solve the problem of launching people into song, and Once does it by keeping Guy and Girl in high romantic tension that invariably dissolves into music. The show is usually anchored in a pub, surrounding the couple with folks eager to strum and sing alongside them. Director Carol Dunne forgoes the jolly bar for a street and gives the supporting musicians stylized motions under atmospheric lighting. It's as if the force of Guy's music magically summons accompaniment. Dunne creates a moment of suspense early in the show by placing members of the ensemble throughout the house, unlit or barely so, while Guy and Girl sing the wrenching "Falling Slowly" in the music store. The accompanying musicians evoke the song's potential by singing and playing from the shadows, as if a story is aching to be told and Guy's musical promise to be fulfilled. Dunne's staging uses minimal, multipurpose furnishings to sketch a host of locations, including an overcrowded apartment of Czech immigrants, a nightclub, a rocky beach and more. Lighting designer Travis McHale conveys a distinctive sense of mood and place with inventive lighting. In the same way that makeshift furnishings form rooms, percussion boxes and guitars seem to fly into the musicians' hands. The feeling is impromptu, as if the audience has stumbled onto a little miracle of musical expression. Scenic designer Alexander Woodward creates a set equally open to despair and dreams. A solid façade of doors, windows and shutters is mortised into an abstract pattern and painted a uniform blue-green. The set isn't an inhospitable wall of closed doors but hints at the jumble of lives crammed together in the city. Guy and Girl radiate romantic sparks, but the thwarted love that bubbles through the story ultimately takes a back seat to their singing and playing within an ensemble. Northern Stage has collected 11 actors who can sing with gorgeous intensity and play instruments with professional skill. As the performers release the flood of emotion in the songs, the jubilation of live music reaches to the theater's rafters. The performers make full use of the songs' dynamic range, with many tunes starting as quiet, introspective musings and slowly ascending to anthemic truths. The music benefits from Northern Stage's rich choral presentation, superbly sung. Dunne and choreographer Kyle Brand stage numbers such as the heroic "Gold" with big, synchronized movements from the ensemble, and musical director Robbie Cowan creates stunning choral dynamism from the singers. As fiddlers and guitarists tilt and twirl around the main characters, they form a magical presence that underlines the romantic fantasy in the story. As Guy, Thom Miller is a theatrical triple threat with an arresting voice capable of Hansard's full octave leaps, fine musicianship and the ability to create a character an audience can love as much as Girl does. On guitar, Miller evokes soft, moody moments and can launch into muscular, percussive strumming to bring out a song's raw power. Lily Talevski, as Girl, is a small but spirited woman who grabs Guy's attention and won't let go. The character explains her unsettling directness by saying, "I am always serious. I am Czech." With lowered eyes, Talevski conveys Girl's conflict between fierce self-assurance and romantic vulnerability. Adam Huel Potter plays Billy, the hot-tempered music-store owner with a heart of gold. Eric Love plays a bank manager with hidden musical talents, evidence that music reaches everyone. As Andrej, a Czech fast-food worker striving for a promotion, Nick Moulton carries passionate hopes. Seth Eliser, as Svec, gets joyously carried away by mastering Irish customs through soap opera and by playing the drums, sometimes to crazed rock-and-roll excess. As Eamon, Tommy Crawford is a happy-go-lucky street musician who lets his guitar and his sneakered feet express his love of music. Dorothy Stanley plays Baruska, Girl's mother, with knowing wit and snappy accordion skills. As Guy's father, Stephen Lee Anderson lends the story an expressive voice and a loving concern for his son. Katie Fay Francis and Rachel Mulcahy are lively fiddlers. Grade schoolers Daria Ballou and Paige Falcone alternate as Girl's daughter. The story puts no serious obstacles in Guy's path, and what he's suffered in love has happened before the musical starts. If the plot is flimsy, it's easy to forgive because this production captures the deep desire to sing and play music. Music is a bond that can connect Czech immigrants with Irish locals, rich with poor, and audience with performers. Once is uplifting without following the usual romantic conventions, except for one: A song can give anyone hope. The original print version of this article was headlined "Raising Hope | Once, Northern Stage"
Thursdays, 2 & 7:30 p.m., Fridays, 7:30 p.m., Saturdays, 2 & 7:30 p.m., Wed., April 24, 10 a.m. & 7:30 p.m., Sundays, 5 p.m., Wed., May 1, 10 a.m. & 7:30 p.m. and Tuesdays, Wednesdays, 7:30 p.m. Continues through May 19 $19-59. Alex Brown writes fiction (Finding Losses, 2014) and nonfiction (In Print: Text and Type, 1989) and earns a living as a consultant to magazine publishers. She studied filmmaking at NYU and has directed a dozen plays in central Vermont.